Scoliosis is a condition in which the spine develops one or more abnormal, side-to-side curves that in turn may affect the body’s overall balance and alignment, as well as possibly lead to other physical and health problems. Although the condition may develop at any age, it most frequently appears during the early teen years of adolescence. A certain degree of curvature is normal in the human spine. For example, the gentle inward and outward curves of the neck, upper back and lower back are necessary for keeping the body properly balanced and aligned over the pelvis. When viewed from the back, the vertebrae of a healthy spine should form a straight line. In someone with scoliosis, however, the spine looks more like an “S” or a “C” than an “I”. The vertebrae involved in the curve also may rotate to some degree, which can further contribute to the appearance of an uneven waist or shoulders. Scoliosis affects 2% of females and 0.5% of males in the general population. There are many causes of scoliosis, including congenital spine deformities, genetic conditions, neuromuscular problems and limb length inequality. Other causes for scoliosis include cerebral palsy, spina bifida, muscular dystrophy and tumors. More than 80% of scoliosis cases, however, are idiopathic, which means there is no known cause, and the person may otherwise be healthy. People with a family history of spinal deformity are at greater risk for developing scoliosis. Early detection is essential! The most common form of scoliosis, representing approximately 80% of idiopathic scoliosis cases, is adolescent idiopathic scoliosis (AIS), which develops in young adults around the onset of puberty. For many adolescent patients, scoliosis is not painful; however, if left untreated, spinal curvature may become so severe that it does cause back pain and pain in other areas of the body, visible spinal deformity and other physical and health problems. Should you notice any one or more of these signs, you should schedule an exam with a doctor. A standard exam that is often used by pediatricians and in school screenings is called the Adam’s Forward Bend Test. Most schools test children in the fifth or sixth grade, and the Adam’s Forward Bend Test can be administered easily by school nurses or parent volunteers. For this test, the patient is asked to lean forward with his or her feet together and bend 90 degrees at the waist. The examiner can then easily view from this angle any asymmetry of the trunk or any abnormal spinal curvatures. It should be noted that this is a simple screening test that can detect potential problems, but cannot determine accurately the exact severity of the deformity. How Is Adolescent Scoliosis Treated? Treatment of adolescent scoliosis depends on the severity and location of the curve and its potential for progression, along with other factors such as the patient’s age and overall general health. Observation or non-surgical treatment, such as bracing, are typically recommended as the first line of defense, and many scoliosis curves never progress to the point where surgery is necessary. Milwaukee Brace (Cervico-Thoraco-Lumbo-Sacral-Orthosis) – often used for high thoracic (mid-back) curves. It extends from the neck to the pelvis and consists of a specially contoured plastic pelvic girdle and a neck ring connected by metal bars in the front and the back of the brace. 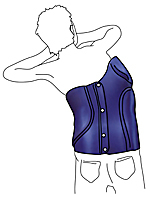 Charleston Bending Brace – worn only at night, the Charleston Bending Brace is molded to conform to the patient’s body while he or she is bent towards the convexity – or outward bulge – of the curve, the concept behind this design being that it “over-corrects” the curve during the eight hours the brace is worn. Providence Brace, a computer-fitted brace worn only at night. Wilmington Brace, a total-contact orthosis typically fabricated from a lightweight plastic material and designed as a “body jacket,” with a front closure and adjustable Velcro straps. Surgery – specifically, spinal fusion – is recommended for severe curves and for curves that have not responded to non-surgical intervention. Spinal fusion involves placing graft material between the affected vertebrae to encourage them to fuse, or join together. 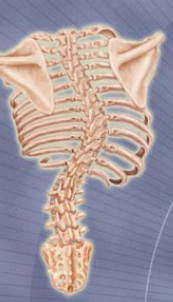 Instrumentation, such as screws, rods, plates and cages, is implanted in skeletally mature patients along the treated area and is a key element because it creates an “internal cast” to support the vertebral structures and redirect stress properly along the spine during the healing process. Ultimately, the goal is to halt the progression of the curve and reduce spinal deformity, to the extent possible, restoring proper spinal stability and alignment. All treatment and outcome results are specific to the individual patient. Results may vary. Complications such as infection, nerve damage, blood loss and bowel and bladder problems are some of the potential risks of any type of spinal surgery, including spinal fusion for the treatment of scoliosis. Additional complications that may be associated with scoliosis surgery include loss of proper spinal balance, failure of the bones to properly heal and fuse (pseudoarthrosis), instrumentation failure and vertebral degeneration in the levels adjacent to the fused section. Please consult your physician for a complete list of indications, warnings, precautions, adverse effects, clinical results and other important medical information that pertains to scoliosis surgery.